I am very excited to announce that Bag It is returning and I'll be hosting the THIRD annual event. Bag It 2017 promises to be even more exciting that last year - if that is possible! New tutorials to inspire from Elm Street Quilts will be shared along with bags made from patterns from our featured designers. The Bag It 2017 event will begin on Monday, September 18 and run through Friday, December 15. 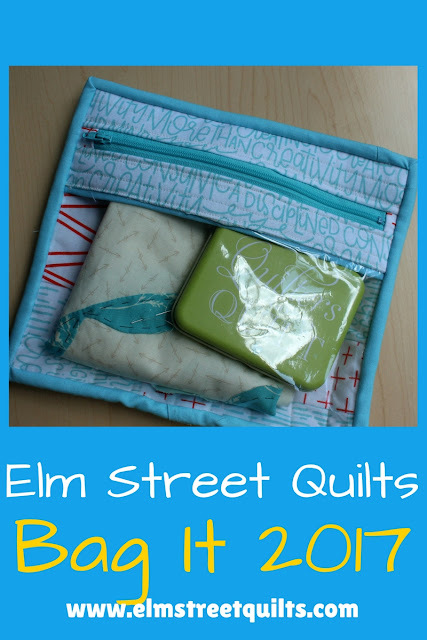 During the event time period, participants are encouraged to make bags and share in link-ups or share in the Elm Street Quilts Facebook Group page. To enter, you can make and share a bag from ANY PATTERN or TUTORIAL. 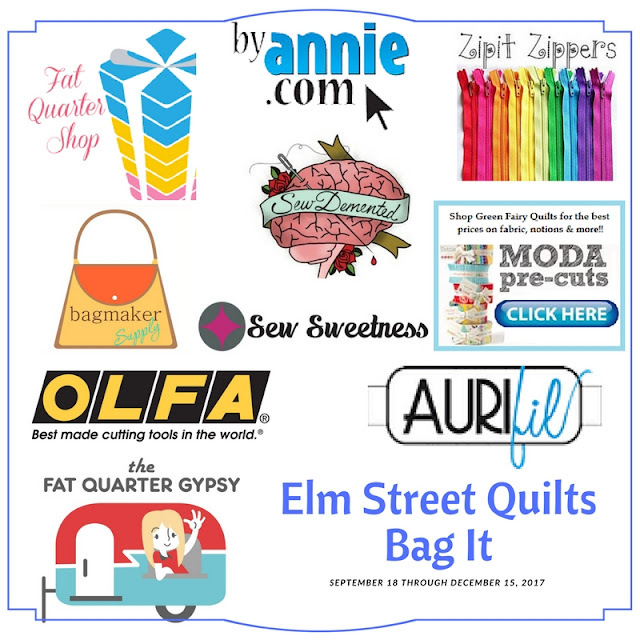 Extra credit will be given to bags from patterns or tutorials from our featured designers - byAnnie, Sew Sweetness, Sew Demented, Fat Quarter Gypsy and Elm Street Quilts. And for the event, we will define a bag as a container made of fabric that you can put something inside. Make a bag for every special person on your holiday list. Special thanks to the Fat Quarter Gypsy for is sponsoring the overall event! More information will be coming in September. Want to be sure you don't miss a thing? Sign up for notifications about Bag It! The block will finish at 9''. He joins his other two buddies from The Tartankiwi's latest QAL called Woodland Creature 2. I am still not sure what I am going to do with these blocks. Perhaps quilt them as individual minis? Perhaps a table runner? 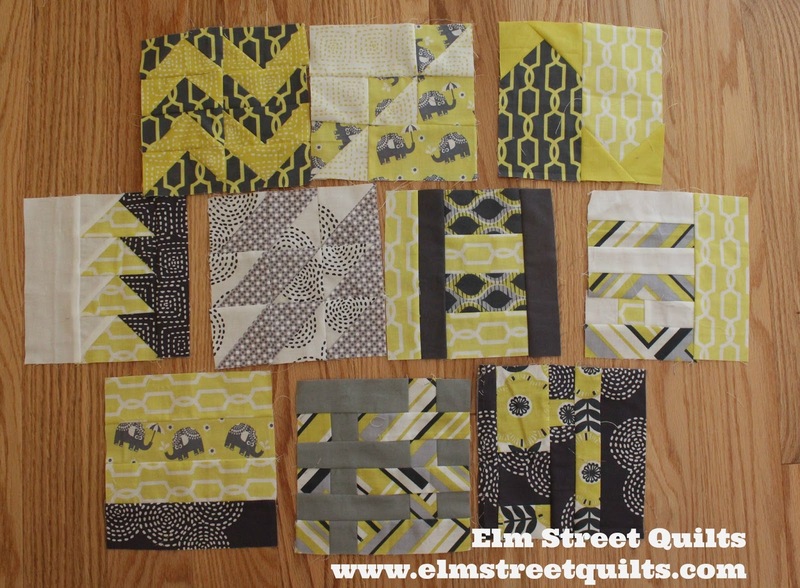 Or maybe group all 4 of them together into a mini quilt. 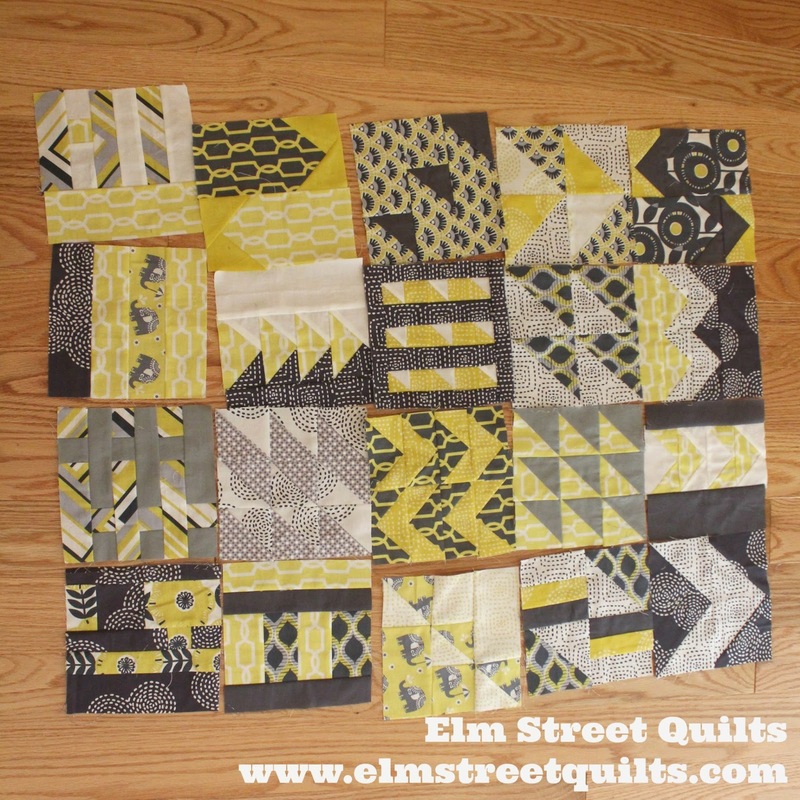 The group mini quilt is what I've been thinking with a layout like the photo below. Any thoughts for me on this? I'll be linking up my blocks with Freemotion by the River, WIP Wednesday's, Let's Bee Social, Midweek Makers. Needle and Thread Thursdays, Finish it Up Friday and Finished or Not Friday. My absolute favorite block so far is the one in the middle row on the right. Love how that elephant is framed. My least favorite block is also in this batch - bottom row, right. For my project, I am using this FQ bundle of Pastel Pop by Michael Miller which was sitting in my stash. 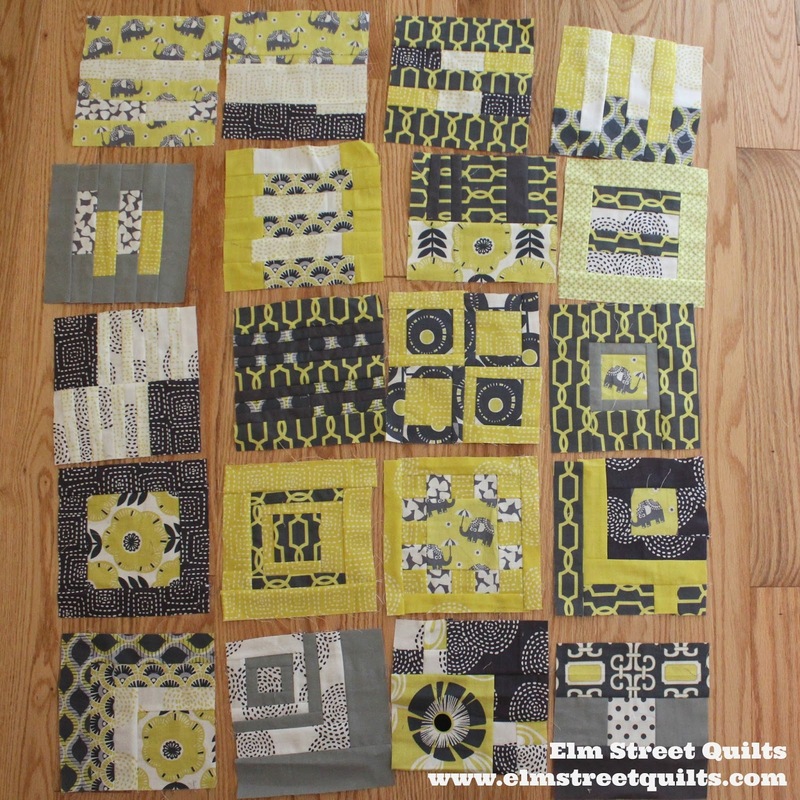 These fabrics are the ONLY yellow I've got in my stash other than a bit in a solid. Read more about the QAL here and follow along on Instagram with #100Days100Blocks2017. 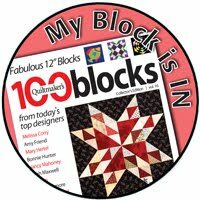 You can find the 100 Modern Quilt Blocks book on Amazon. Ready to link-up your July finishes? And don't panic, link-up is open until 11:55 pm EDT on July 31! New to One Monthly Goal? Welcome! You can read about the event and the rules on the main event page. 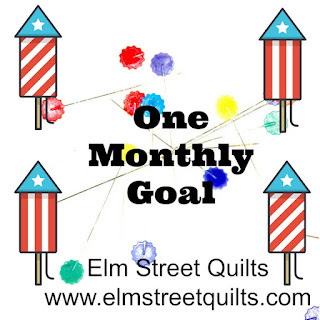 Now it is your turn to link up - share your goal finish for July. Please only link up if you finished your goal and if you also participated in the July Goal Setting Link-up. Clothworks is offering a FQ bundle of Organic Sprinkles fabric. and Melissa Corey from Happy Quilting is offering the lucky winner three (3) PDF patterns of their choice. Congratulations to Elisabeth, Liz & Sharon - the lucky winners for July. Visit the One Monthly Goal event page for the specific requirements for links and social tags. I made a thank you gift for my sister celebrating a state they love to visit. The pillow is 18'' square. The states and lakes are raw edge appliqued and outlined in black several times using my FMQ foot. The edges of the lakes that meet up to the state are appliqued in blue. I wrote the names of a bordering state, the lakes and of Canada in a matching thread. I used a fusible fleece for this front piece - the back shows off the quilting. I think this looks cool. 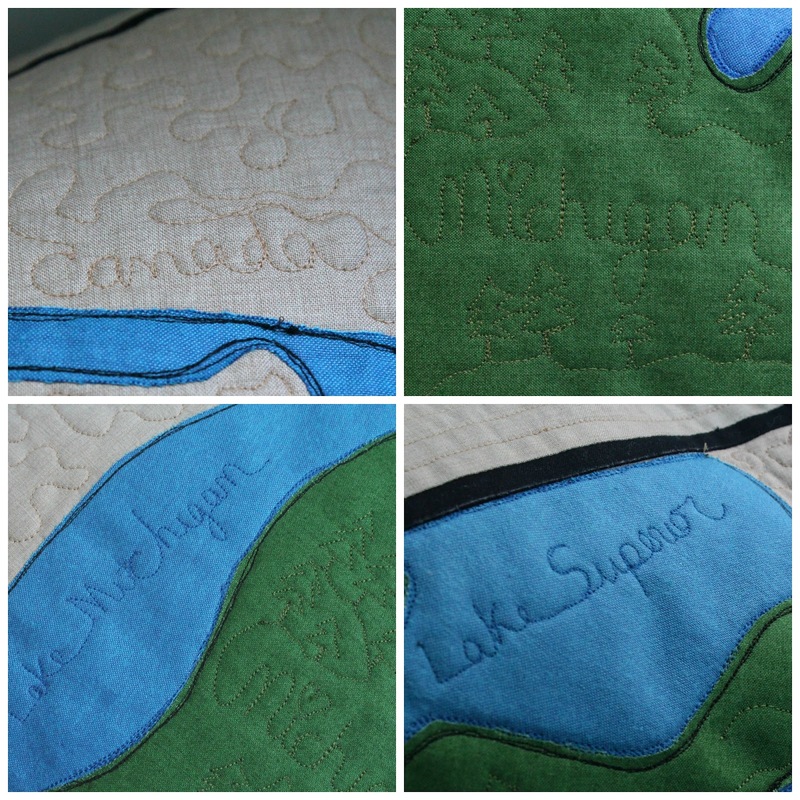 To create the applique outline for state and the great lakes, I used EQ7. I thought I'd share a brief tutorial on how I did this. First, I screened grabbed from google maps using a snipping tool. Choosing New Block then Easydraw+Patchwork Draw, I then imported the image into EQ7 (see red circle upper left in diagram below). Then, using the applique tab and the Freehand tool (see red circle upper left in diagram), I traced the state outline. To print, I choose print block and go to the OPTIONS tab in the print dialog. There I make sure MIRROR is checked so it prints a reverse image. Back to the BLOCK SIZE tab, I choose 15 x 15 '' for my applique, sized for my 18 x 18 '' pillow. Choose PREVIEW to make sure you are getting what you expect. 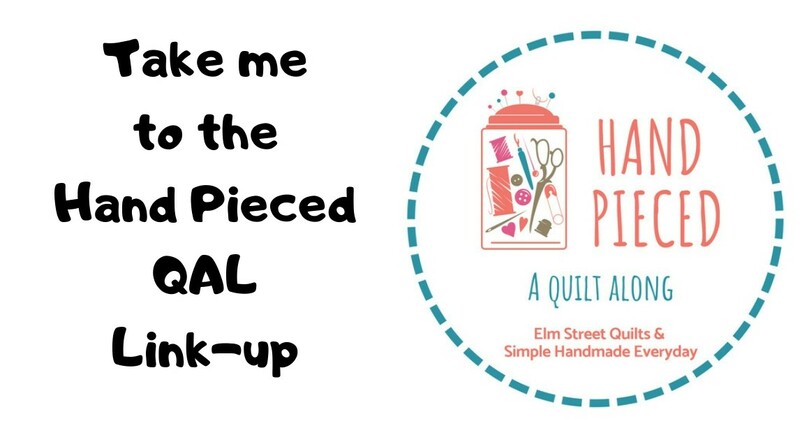 My applique will print over four pages - easy to tape together to make my patterns. You can see how the image is nicely reversed. I choose new block and repeated the steps for the Great Lakes. It could have been done in one big block but it was helpful (to me) put the lakes in a second block. Less to start over again with when things went wrong as they are known to do. Does that all make sense? Drop me a question in the comments and I'll be happy to help. 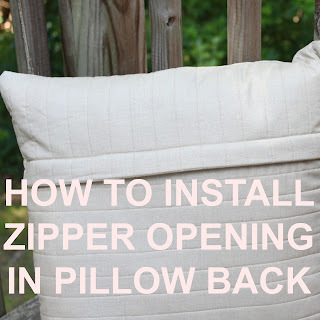 For a tutorial on putting a zipper in a pillow back, please see this post. I'll be linking up my pillow with Freemotion by the River, WIP Wednesday's, Let's Bee Social, Midweek Makers. Needle and Thread Thursdays, Finish it Up Friday and Finished or Not Friday. How can I resist such a cute face on this otter? Or this sweet Kingfisher? Did you see the amazing giveaway from FQS? 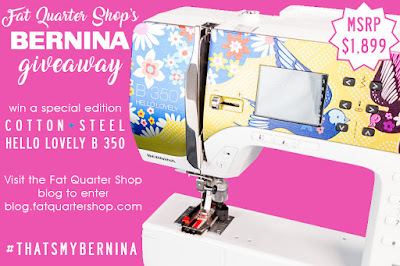 They are giving away a special edition Cotton + Steel Bernina 350SE! No purchase necessary to enter. Commenting on this blog post does not count as an entry. Fat Quarter Shop employees, Bernina employees and bloggers paid or compensated by Fat Quarter Shop are not eligible to enter this giveaway. And now there is 70 - a passing grade! Here are the next batch of 10! My daughter will have the assignment of putting the blocks into three piles - the blocks she loves, the ones she hates and everything else. I'll put together the final layout from there! Mom turns 80 today and I made a signature quilt to celebrate. 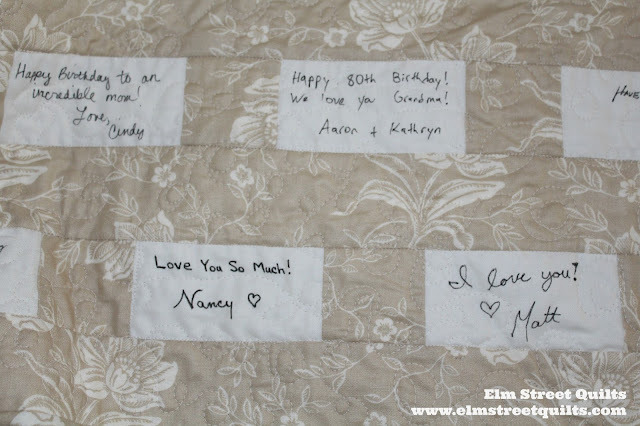 We held her party in June and I just loved giving her the quilt that everyone had signed. Label above was printed at Spoonflower. I printed other photos on fabric - see what I made for my dad for Father's Day here. What fun she had reading the messages that everyone had written. In a post earlier this week, I wrote about the process of designing the quilt and collecting the signatures. You can read about it here. Signatures were collected from her 7 daughters, her 7 son-in-laws, her 16 grandchildren plus 1 granddaughter-in-law plus her 2 brothers, her 2 sisters-in-law and my dad. That's 36 people! Signatures from the daughters and our families were all done on the rectangles that border the top and bottom of the quilt. Then my sisters and I as well as mom's brothers and their wives captured a special memory or special message which I put in the center of the star. I enjoyed every minute of creating this quilt. Happy Birthday Mom! You are one amazing person! My mom turns 80 years old on Friday. To celebrate, I made her a quilt that contained signatures from the 36 members of her family. This includes her brothers and their wives, her daughters, son-in-laws, the grandchildren and one granddaughter-in-law. 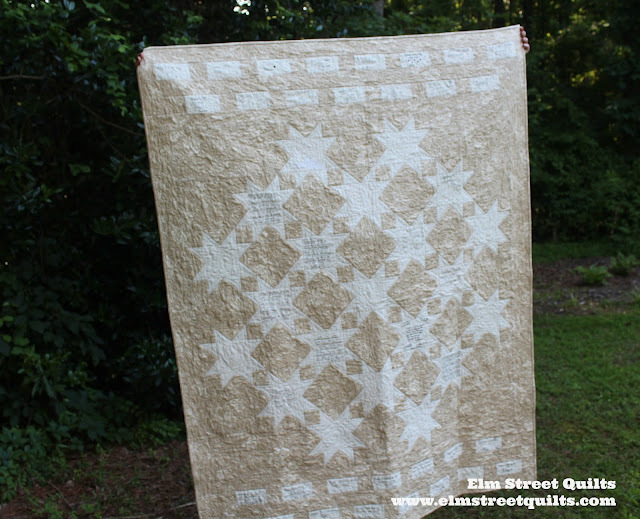 I'll share the finished quilt in Friday's post - on her birthday! - but today wanted to share today how I approached the process of designing the quilt. The first was to include 80 flying geese blocks. Flying geese (the real kind) spark a special memory for my mom. The second was I wanted everyone in the family to sign their name onto fabric. In addition, I wanted to include some extra blocks with written memories from growing up. 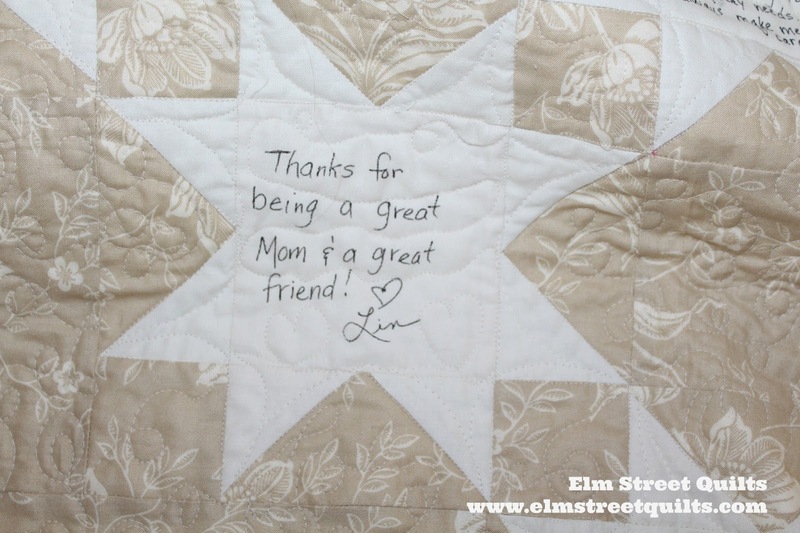 The third was that the signatures needed to be the star of the quilt. This was my first EQ7 design, rejected because I thought the geese were competing too much with the signatures. After auditioning several scrappy fabric layouts in EQ7, I settled on a pretty fabric from my stash. I knew mom would love the color and it wouldn't compete with the signatures. 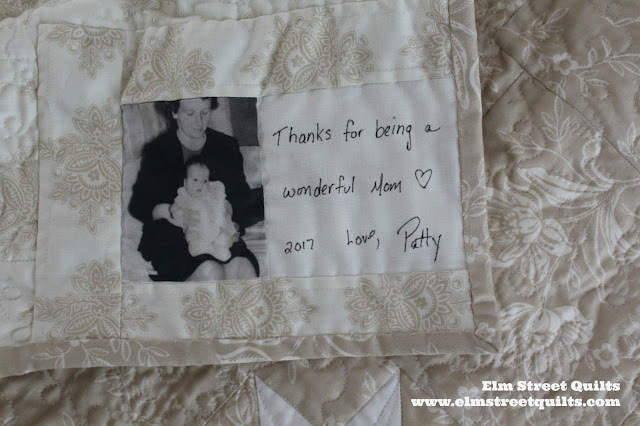 For this quilt, I had about two months to make the entire project before gifting. 32 of the 36 signatures needed to be collected by mail at twelve different addresses. instructions with pictures to make sure everyone understood the concept of the 1/4'' seam allowance! To prepare the fabric for writing, I ironed freezer paper wrong side of my neutral fabric and then cut this into 4.5'' squares and 2.5 x 4.5'' rectangles. No package went to mom's house - a sister who lives nearby was tasked with getting my dad's signature in secret. It was so much fun to get back all the signed fabric! Everybody did their job and promptly signed and mailed things along on time. I was very proud - and I'll admit - a little surprised on how well everyone followed directions. 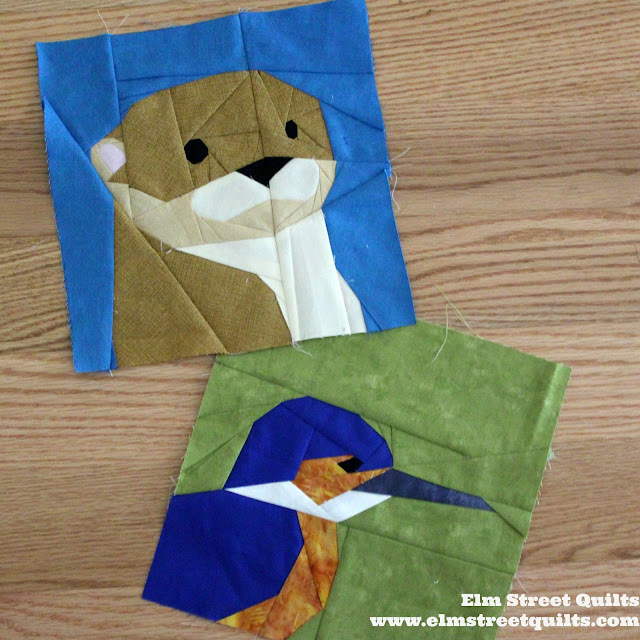 While I waited for the signatures to return in the mail, I started playing more with possible designs in EQ7, looking for a design that used 80 geese, ten 4.5'' squares and 35 (2.5 x 4.5") rectangles. EQ7 gave me the opportunity to try many different things, including the design below which I never finished. I was finally able to settle on my final design after yielding one of my original design parameters - I made more geese. With the number of geese restriction lifted, the fun began and I started creating many different design possibilities. I never drew the final one in EQ7 but this one is close to where I ended up. 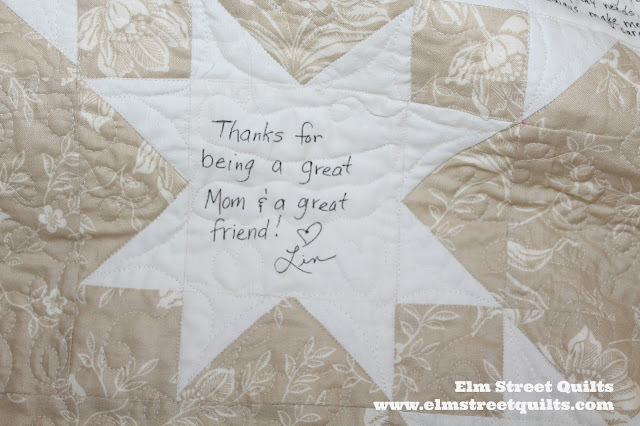 I'll share the final quilt on Friday and my special quilt label. Several friends offered guidance, options and encouragement along the way. Since Mom reads my blog, I had to keep the whole project secret. Thanks Kris, Frances and Paige! 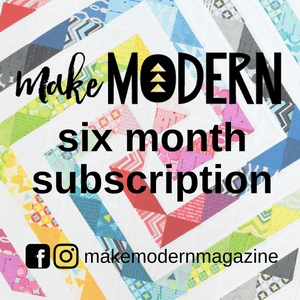 I've belonged to my local Modern Quilt Guild for a year now and so very much enjoy the people, the challenges and our meetings. We had a pillow exchange yesterday. Assignments were handed out in secret. 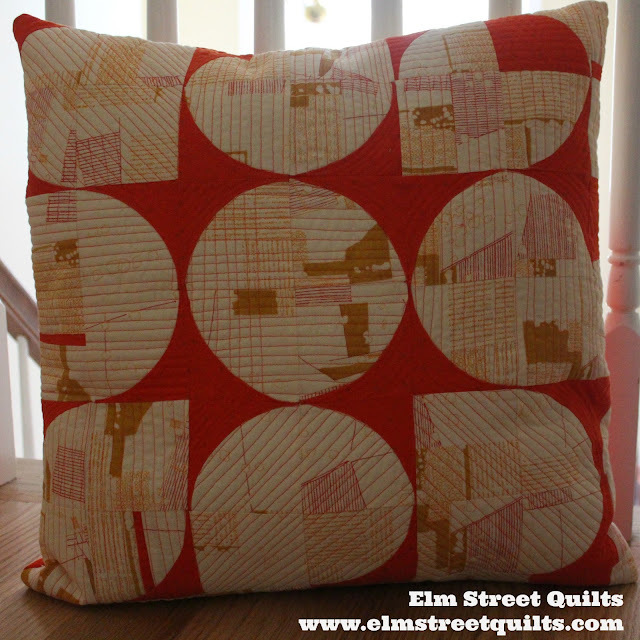 I stalked my assignee a bit on Instagram and decided to focus on a pillow that used curves, orange (a dominant color in her quilts) and use fabric from a favorite designer - Carolyn Friedlander. I was so happy with what I came up with! I quilted lines going every which way using my walking foot and had a blast. I managed to include a bit of the selvage in a place that will show if you lift up the zipper flap. I really liked this bit! The pillow form used was 2- x 20''. 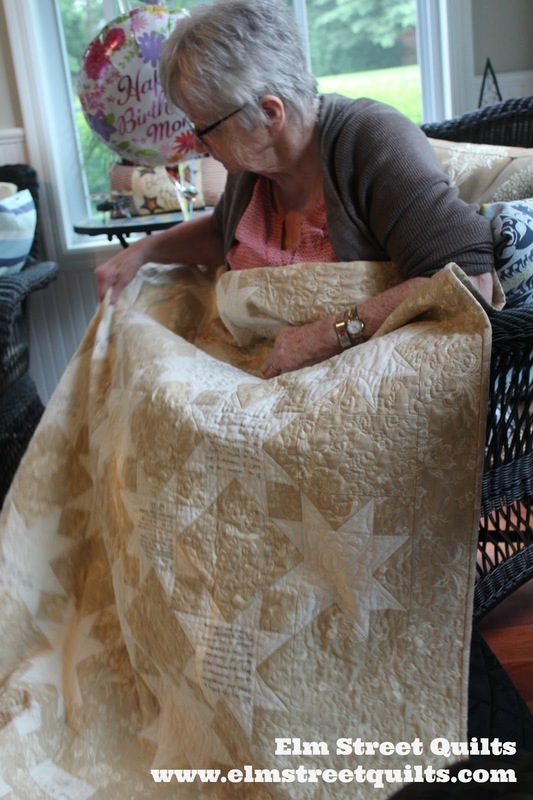 Once quilted (photo below is before quilting), my pillow top measured roughly 19.5'' square. The pillow form filled it out quite nicely. Did I mention how much I loved doing the quilting? It took awhile but I had music playing (Hamilton) and enjoyed every minute. I created a tutorial on installing a zipper in a pillow back - check it out here! I used this tutorial for making my templates and found this video on curved piecing quite useful.